I have mentioned AlertsUSA and Threat Journal in the post I wrote called “Way’s to Stay Informed and be Alerted in an Emergency”. I recently had the opportunity to ask them a few questions about AlertsUSA and Threat Journal, about some recent world events and what the largest threat to America and American interest abroad. So make sure you see the bottom for details on the contest. I have been receiving Threat Journal for two years and follow it on facebook as well. I try to stay on top of current events, but Threat Journal always seems to find a story or two that I hadn’t seen before. To start off, can you explain what Alert USA and Threat Journal are and how they can assist in one’s preparedness? AlertsUSA is a 12 year old emergency alert system for mobile devices. We monitor news and intelligence information from around the world on a real-time basis (24/7/365) and inform subscribers, via SMS messages to their mobile device, when developments occur which pose a direct threat to the U.S., as well as its citizens and interests at home and abroad. The service is in use by federal, state, county and municipal government agencies, first responders, corporate security professionals dealing with large, multi-site organizations, as well as the general public. Every story reported by the mainstream media passes through editorial filters seeking to determine if it will impact ad sales, a business partner or a subsidiary. Often stories are stifled as a result. None of these are factors with AlertsUSA’s reporting. It is impossible for individuals to stay parked in front of their computers and TVs monitoring world developments around the clock. This is AlertsUSA’s sole function. And as we deliver breaking information via one’s mobile device, we can reach subscribers, anywhere, anytime, 24/7/365. We are NOT an automated service. We do NOT send out alert messages just to generate traffic. We do NOT inform subscribers each time a fire engine is called or a SWAT team investigates a suspicious package. We often will go for days without reporting anything as there is simply nothing happening warranting an alert. How do you gather Intel and how do you validate it as credible? “Our information sources span mainstream media outlets worldwide, premium targeted information services, private intelligence groups and information provided directly to us by government agencies and departments both foreign and domestic. This combination, developed and continually refined over the past decade, gives us an excellent handle on events worldwide. In recent history there has been a Russian TU-95 bear bomber flown over the US territory of Guam. North Korea has also made several hostile comments towards America and Iran has made several inflammatory statements as well. Do you foresee any circumstances in which these countries intentions amount to more than saber rattling? The U.S., Russia and China regularly test each other’s responses to encroachment on their territory and that of their regional strategic partners. There are a variety of reasons for doing so, including measuring response methods and timing, signals and electronic intelligence gathering and more. Probing each other’s defenses is routine in an effort to understand the weapons systems and defense methods used by the other side. The same occurs with land and naval forces. As an example, in 2009 Russia conducted simulated bombing runs on Alaska and California. It is also not uncommon for Russian missile and attack subs to be regularly tracked off the East Coast of the U.S. and as recent as December and January, inside the Gulf of Mexico. China is only now beginning to field systems to enable them to carry out such missions outside of their immediate region where they are very active. Given current events we believe that major conflict between the U.S. and Russia can break out as a result of events in the Middle East. Russia has deep economic, military and cultural ties with Syria stretching back to the 1950’s. Tens of thousands of Russians live in Syria. Russia’s use of the deep-water port at Tartus is critical for their naval presence in the Mediterranean and supports not only the Russian Black Sea and Northern Fleets operating in the Mediterranean, but is also being upgraded to support nuclear-powered warships and submarines. It is also their only base in the region once outside of Black Sea. Russia has publicly stated that foreign meddling in Syria could end up as a nuclear conflict. Closer to home, Russia maintains strong economic, industrial and defense ties with Venezuela. Russia and Venezuela regularly hold joint military maneuvers. Venezuela is also one of Russia top buyers of defense hardware, itself a significant source of revenue for the Russian government. N. Korea poses one of the most profound threats the U.S. is currently facing, particularly in light of their recent nuclear and 3-stage missile tests. The current U.S. missile defense shield, started under President George W. Bush, was rooted in part due to concerns over N. Korea. With stiff new economic sanctions in place and rather large defense exercises slated to begin in mid-March with S. Korea, the U.S. and several other nations, N. Korea has been making threats of preemptive nuclear strikes on both S. Korea and the U.S.. Here is a Video from Good Morning America covering North Korea Threatens a Pre-Emptive Nuclear Strike on U.S. The best estimates put the current range of N. Korea’s ICBMs as being able to strike Alaska, Hawaii and the Western U.S… Miniaturization of nuclear warheads is merely a function of time, as are increased range of their missiles and the hardening of the warhead package to survive reentry. This does not preclude quiet assistance from other Nation’s such as China, which has already supplied significant portions of their existing medium and long range capability. N. Korea’s nuclear capability itself was enabled by Pakistan. It is our opinion that the most immediate and easily achievable threat posed by N. Korea to the U.S. comes in the form of an EMP style attack. While their missiles may not be able to survive full reentry, detonation of a nuclear device at a much higher altitude could potentially devastate parts of the U.S. power grid, transportation and communications networks. The second, and perhaps more concerning threat comes from N. Korea’s willingness to sell the same capability to other nations, such as Iran or other Middle East players. Iranian personnel are widely known to be present in N. Korea during missile and nuclear tests. N. Korean personnel are also a constant feature at Iran’s nuclear facilities. As for a particular incident or event that could trigger such an attack, we believe that move would not come out of aggression, but fear. Fear of attack and fear of the further choking of resources needed for the survival of the state. While many countries such as North Korea or Iran, don’t have the missile capability to launch a nuke from their country to land on the continental USA, (I know North Korea either has gotten the technology or is close to having it). Would it be possible for them to hide a missile on a ship carrying shipping containers, and launch an EMP style attack from a hundred miles from our shores? “In addition to that written above, this is most certainly a possibility. The USGOV certainly appears to be bolstering East Coast surveillance and defenses against some type of threat. In January, it was announced that the U.S. defense department would be closing down a balloon surveillance program being run on the U.S. / Mexico border known as TARS, or the Tethered Aerostat Radar System (TARS), which was an aerostat-borne surveillance program used to support counter-narcotic operations, mostly in southern border regions. Four TARS are deployed in Texas, two in Arizona and one in New Mexico, Florida, Louisiana and Puerto Rico. In addition, it was just announced that a large drone base is being developed at Naval Air Station Point Mugu in California for broad area ocean surveillance. The systems to be deployed are high altitude, long duration platforms. I receive the occasional email and have seen posts on other blogs and forums about the government getting ready for civil uprising, which includes FEMA camps. Do you think these reports belong in the realm of conspiracy theorists and tinfoil hatters or is there credence to it? “We know from direct knowledge that many of these claims are spot on accurate. While the specifics may be embellished from story to story or site to site, it is solid fact that our nations leaders know that the U.S. is now in a slow motion train wreck and they are most certainly preparing for a breakdown of social order. The root cause will be, for sure, a collapse of the U.S. dollar and economy. This collapse will come as a result of astronomical debt and spending levels. We are already well past the point of being able to correct the problem. In fact, the U.S. military has, since ~2006, has been actively conducting war gaming exercises and preparing contingencies for just such an eventuality. Most Americans under the age of 60 – 70 have never known extreme national hardship, though it is a non-stop occurrence elsewhere in the world. We just never hear about in the MSM. Most Americans have never been out of the country and so their world view is severely limited to what they are taught in our increasingly worthless classrooms or see on our increasingly worthless television and cable channels. Most Americans have no clue that the largest holder of U.S. debt, even before the Japanese (#1) and the Chinese (#2) is our own government. That’s right. Our government must purchase its own bonds just to keep the system afloat. While intentionally called strange names like “quantitative easing”, it is essentially just “printing money”. 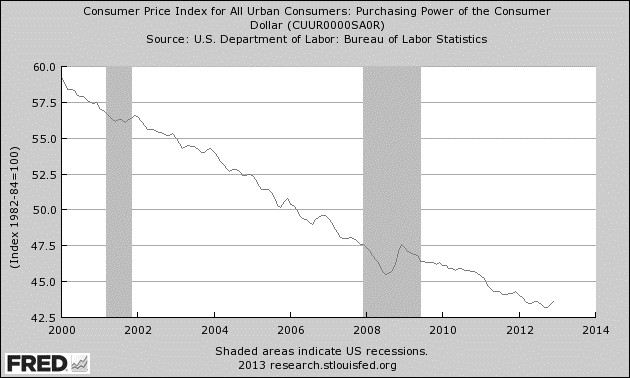 The following chart, from the fed itself, shows the devaluation (purchasing power) of the dollar over time. 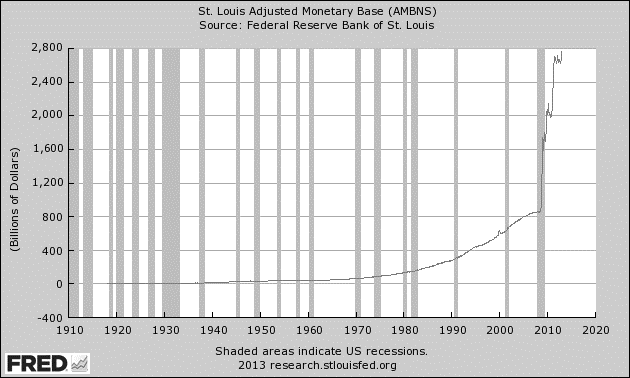 This is the result of money printing. The following chart shows the average life span of world reserve currencies since the 1400’s. America is no different, except perhaps for the sheer size of our debt load and the penetration into other countries. When one has an understanding of these problems, and how many people are completely dependant on Uncle Sugar for their daily bread and entertainment, they will begin to understand why detainment camps, massive purchases of ammo and hardened vehicles are necessary. None of this is tin foil hat subject matter, except in the minds of those who do not understand what is before us. What would you say is the largest threat to the average Americans’ way of life that is based outside of America? For example Iran mining the Strait of Hormuz, and gas prices skyrocketing. What would you say is the biggest threat to American national security inside our border? While there are MANY threats, we view the biggest threat as the pending economic collapse. It will happen. This is a given and is only a matter of time. While the blame for the event will be intentionally shrouded with some other event (bank takedown by some ‘evil foreign cyber attack’, or outbreak of serious conflict elsewhere in the world), the impact will be the same. What other current events should we be paying attention to that haven’t been mentioned in the above questions? 1. It is important that the readers keep a close eye on our aging nuclear power infrastructure. Many of these facilities have been operating well past their intended design life and are precariously balanced with regular breakdowns. There is far too much money in play for these systems to be taken offline willingly or for the good of the general public. With the current administration’s attacks on coal-fired power plants, there are also few alternatives. At some point there will be a catastrophic failure at one or more of these facilities. If you reside near, or downwind, from one of these facilities you need to maintain peak awareness. 2. More than any other threat currently facing this country; the one that has me most concerned is related to President Obama’s trip to Israel later this month. Much of the visit is intended to discuss a new peace deal between Israel and the Palestinians, halting the construction of new settlements and the establishment of a Palestinian state. This trip should have all Christians cringing as God has firmly warned that any nation that even attempts to divide up Israel would enter into his judgment. Joel Ch. 3 is a great place to start. Also, a simple Google search using the phrase “dividing the land of Israel” will provide dozens of sites detailing the troubles that have befallen those nations through history who have already tried. Draw close to the Lord. There are very difficult times ahead. AlertsUSA has generously offered the Prepared Christian.net community a chance to win five radiation safety packages. All you have to do to enter is click the picture below that shows the contents of the radiation safety kit, or follow this link to Threat Journaland sign up for the free weekly newsletter from Threat Journal. The contest will run for four weeks and the winners will be chosen on April 8th, 2013. I will make a reminder post once a week until the winners are chosen. I want to thank the folks at AlertsUSA again for their generosity in taking the time to answer these questions and in giving away five great prizes. I think this is an important article. Please consider sharing it with everyone you feel may be blessed with information concerning current threats to America. AlertsUSA has been kind enough to offer special pricing. Normally the service is $99 a year, they are now offering the service for $75 a year for Prepared Christian readers.